Simon does not comment to the media because he believes the candidates or spokespeople should deal with the media. A campaign manager in the media does not win votes. 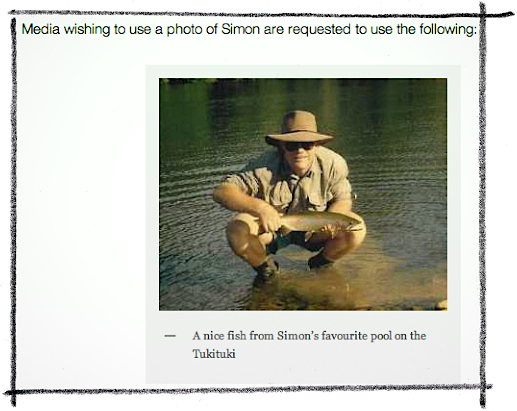 Media attempting to contact Simon will be met with the same response – silence. Journalists should not take this personally; it is a deliberate policy that Simon has no intention of changing, especially since the media have an unfortunate habit of interrupting fishing or shooting. Almost a year ago, leaked National Party board minutes were reported by TV3 wherein Simon Lusk was described as someone motivated by ‘a very negative agenda for the Party’ ‘that poses a serious risk to the Party‘. See The Simon Lusk stigma? Bagman or bogeyman? Simon Lusk is a shadowy figure in the National Party, credited with getting several MPs elected – yet publicly discredited as irrelevant by John Key. Andrea Vance reports. Simon Lusk is one of the most intriguing figures in politics. 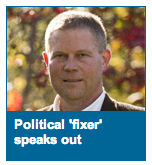 The arch political fixer shuns the limelight, rarely venturing from his home in Havelock North to Wellington. 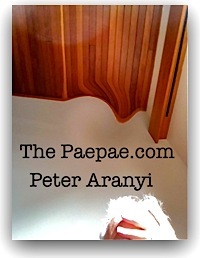 He maintains a strict silence about his clients – mostly wannabe National MPs. For me, this was the best quote: “Many on the Left lack grace and I find it hard to deal with people who lack grace.” Says Simon Lusk. So, who is Simon Lusk? Simon Lusk in the headlines again! Media should refer to the media page, and understand why Simon does not talk to the media. It’s a fine line between good humour and being a dickhead. This request (below) makes me think he crossed it. Actually, while it’s not locked behind a password, Simon Lusk’s ‘Please hire me as your campaign manager! I can help you get selected as a National candidate! Lose weight now! Ask me how!’ website is an entertaining read for all sorts of reasons. Then there’s the near-schizophrenic dichotomy of trying to skite about what you do while simultaneously clinging to the flimsy membrane of a dark arts, ‘I operate in zee shadows. Listen carefully, I will say this only once’ legend. Chris Tremain: Napier Electorate Campaign 2005. Result: Win. Majority of 3591. Seat of Napier won by National for the first time since 1951. Peseta Sam Lotu-Iiga: Maungakiekie Electorate Campaign 2008. Result: Win. Majority of 1942. Acknowledged: Vote for Change Web Site, various media. Mr Lusk, who did not return calls yesterday, is understood to have been supporting Dr Brash in recent weeks. Let me be clear: short of running foul of the Fair Trading Act or Advertising Standards Authority, Simon Lusk is perfectly entitled to promote himself as a campaign ‘wizard’ to credulous wannabe National candidates any way he likes. And observers like me are entitled to chuckle at him. … and that’s got to be bad for business doesn’t it? This latest charm offensive — talking to Andrea Vance (Political ‘fixer’ speaks out ), and being more accessible via his website, etc. may be a straightforward business response: strategic self-promotion to factional elements and National Party prospects in the run-up to next year’s General Election. 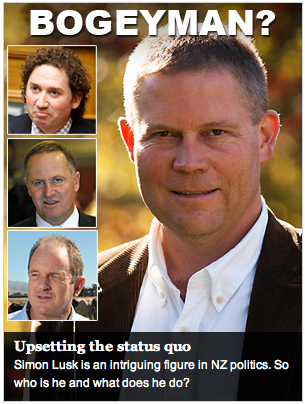 National ran a pretty nasty inside campaign against Simon and myself. Peter Goodfellow himself tried to cancel my membership, held up a renewal for 6 months and personally rang an electorate chair, an MP and several committee members to try to block my membership. the party now has specific Whaleoil and Lusk clauses written into candidates college applications which is hilarious. Do they not think we have copies of it all? I’ve even had people tell me that if I wanted to go further in politics then I’d better shut up…when that comes from people in their 60s and I’m in my forties I can safely assume that I will outlast them, and the fact that they issued such threats shows I am already outwitting them. Ahh the do stuff for free brigade, another senior member who ironically charges professional services fees to the party himself…his pals are likewise employed in jobs where their professional services are charged. Hypocrites the lot of them. You pay a printer for quality materials, you pay a lawyer for professional advice, same with an accountant, you pay a speech coach but bizarrely these old coots think that the one person who will actually provide you with sound political and carrer advice should do it for free is just…well…dumb. The unnamed coward who snitched to Vance freely admits that Simon is better than the old 80/20 rule…he is the 85/15 rule. No wonder people see value in what he does. …just shows how dumb the party hierarchy are to have even made that statement. Right. When they’re in their sixties these guys will be unstoppable. 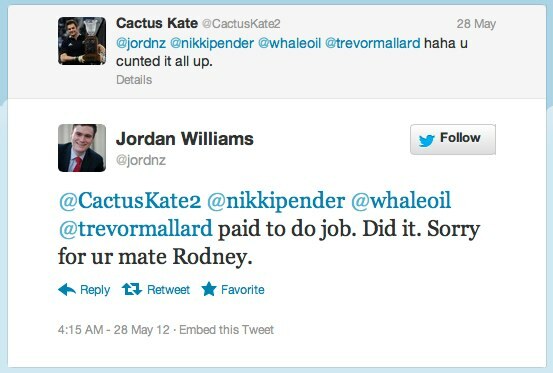 Also, one has to laugh, robustly, at Cameron Slater’s puerile partisan denigration of one of Andrea Vance’s sources as an “unnamed coward who snitched” while he runs a ‘tipline’ and publishes various poorly-sourced scuttlebutt, rumour and disinformation when it suits him. Hahaha.